Are your clients hitting a training plateau or getting bored with their workout? Are you getting bored using the same exercises? Try manipulating the training variables to bring in some fun factor while staying true to your client’s goals and abilities. Sometimes we get stuck in a training rut, whether for our clients or ourselves, using the same recipe of exercises we know will bring serious results. To continue to stimulate our muscles, and our minds, these tried and true training plans could use some variety swaps in the session ingredient mix. The body adapts to the changes that it continually encounters, which is called the SAID principle: Specific Adaptations to Imposed Demands. Whether this is strength or weight loss, our body gets better and more efficient the more it is exposed to the same stimulus. In order to break through a plateau (or boredom), the demand needs to change so the body will continue to adapt. Change those demands by modifying the acute variables of exercise selection, repetitions, sets, intensity, tempo, volume, rest, frequency and duration. Here are some ways to adjust these demands but be sure your clients’ fitness level and goals are a match for the adjustments. How many exercises can you name to work the chest? What about the back? Probably more than one, and probably more than one for each phase of NASM’s Optimum Performance Training™ (OPT™) model. Imagine if the only choice for the chest was a standard push-up. Not only would you adapt to and excel at the push-up after some time, but you’d probably be a little bored as well (it’s like eating steamed broccoli and chicken- every single day). By selecting differing or progressive exercises for the target muscle groups, adaptations can continue. Consider modifying exercises with a different plane of motion, using single, multijoint or total body moves, or changing the surface or equipment selected. Swapping in a kettlebell for a dumbbell in a renegade row or rowing on a TRX Suspension Trainer might just be the change your client craves while still being safe and appropriate. Exercise selection can also be expanded to an equipment specific or sport-based workout theme (consider kettlebells, MMA or even stand up paddleboarding (SUP)). Partner or small group trainings are a fun option as well. Sets, reps and training intensity selections are very intertwined with each other when it comes to the OPT model and the phase of training a client is in, along with their goals. 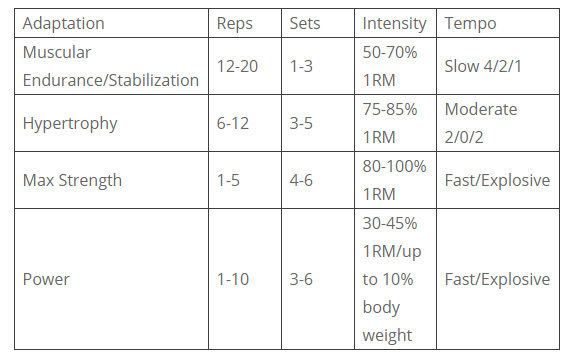 Repetition ranges, the intensity (%1RM), and even the tempo of the reps, coincide with specific adaptations (i.e., endurance, strength, hypertrophy, power) as you’ll see in the chart below. Additionally, as you increase the load, the number of reps the client can properly complete will go down. Don’t substitute good form and a lower rep count to complete a few more reps with bad form. Save time during a workout by trying a circuit. Instead of taking a long rest between each set, keep the momentum going by trying a peripheral heart action circuit or a vertical loading format. The peripheral heart action system alternates an upper body exercise with a lower body exercise where as vertical loading entails starting with one body part and then switching to another. These systems allow a muscle group to recover while another is being worked, thus reducing the time spent resting between sets as seen in the more traditional horizontal loading system (e.g., 3 sets with 90 second rest periods). Supersets are another variation to stimulate the body and the mind. There are two approaches to supersets: using different exercises back to back for the same muscle or using two different exercises for opposing muscle (groups). As seen in Phase 2 of the OPT model, when using exercises for the same muscle groups the first move will be focused on strength and the following move on stability to further fatigue the muscles (or another example, Phase 5 of the Power Level where a heavy strength load is followed by a lighter load with a speed focused tempo). If the training program has been a whole body focus each session, perhaps trying a split-routine approach will counter that plateau. For a client transitioning to split-routines, consider trying a combination of a two-day split-routine and one day with a whole body program (e.g., 3 sessions/week). Remember to decrease the volume for every increase in frequency. Another option is to add a pyramid challenge by incorporating either increasing or decreasing weight for an excise or two, or three. Start with a light weight for 10-12 repetitions, then on each set increase the weight and reduce the repetitions until only a couple of reps can be completed. This can be done in reverse as well with a heavy start and a light finish. No need to do this for every exercise of the workout! Try using it with an exercise your client excels at to further peak their performance. Is one approach better than the other? A recent study of experienced athletes found that changing the training load schemes daily improved strength gains compared to other approaches (Eifler). Ultimately, the choice of variables in the training session will depend on the client’s specific needs and goals (e.g., weight loss, strength, corrective exercise, sport specific skills, etc.). Sometimes your client might arrive to a training session not quite up to the demands of what you had planned (or specific pieces of equipment in the planned session might not be available). Try using these recommendations to adjust the training variables so your client can be successful and safe. This might be as simple as increasing rest time between sets (or switching from a vertically loaded circuit to a horizontally loaded workout), decreasing the reps or loads to the lower threshold, training on more stable surfaces, or using equipment that may be a little less challenging, mentally and physically. Clark MA, Sutton BG. Lucett SC. NASM Essentials of Personal Fitness Training, 4th ed. rev. Burlington, MA: Jones and Bartlett Learning; 2014.